We have thousands of properties for sale all over France. But we've no property for sale in Ile de Ré at the moment. And that's something we want to change. If you have a property to sell in Ile de Ré (or nearby) then act now to get a 50% discount. Just place your advert in the normal way (Click here to place your advert). Then send us an email quoting "Ile de Ré" and telling us that you you saw this offer. The beautiful island of Île de Ré can be found off the west coast of France, in the region of Poitou-Charentes and the department of Charente-Maritime. The island is blessed with long, flat and sandy beaches, and cool, shallow waters, ideal for safe swimming and sunbathing. Popular with families, with teenagers and with everyone who enjoys the traditional pleasures of the seaside, the island also enjoys a mild and sunny climate, with almost as many hours of summer sunshine as the south, but with a less savage heat. And although the winter population is just 16,000, be warned that in summer this multiplies tenfold to a staggering 160,000. Despite its tourism, the island retains its character and beauty through building regulations, which decree that houses must conform to the standard colour scheme of whitewashed walls with green shutters, and must be no more than two storeys high. Thus the Île de Ré avoids the ugly high-rise fate of so many seaside resorts. Oysters and mussels, alive, alive oh! The freshest and best of seafood is available on the Île de Ré, which is particularly noted for its home produced oysters and mussels. If you are a seafood fan this is reason enough to own a house on the island! There are many good restaurants and shops here, but as you would expect, the prices can become on the high side in the summer season. For many years the Île de Ré has attracted artists not only because of its beauty, but also because of the unusual clarity of the light. There are several galleries to visit, or why not allow the island to inspire you and try your hand at painting yourself? Cycling is a popular activity on the island, with 60 miles of cycle paths taking you away from busy roads and keeping you safe. There are cycle hire shops on the island too, so bringing your own bike isn't a necessity. Many are family friendly and offer children's bikes or bikes with trailers for children attached. Do you know Ile de Ré better than we do? Do you have photos of Ile de Ré? WHERE IS Ile de Ré? 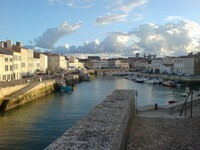 The island is found off the central western coast of France, in the region of Poitou Charentes. It is close to La Rochelle, and is connected to it by a 3km long toll bridge. The only other access to the island is by boat. Access: From the UK you can fly to La Rochelle with Ryanair or with Flybe. Economy: The economy of the island is based on the production of seafood, mainly shellfish such as mussels and oysters, and on tourism. Interesting fact: The island is famous for being the departure point for convicts being shipped to the penal colonies. The notorious Henri Charrière, better known as Papillon, was one of these!